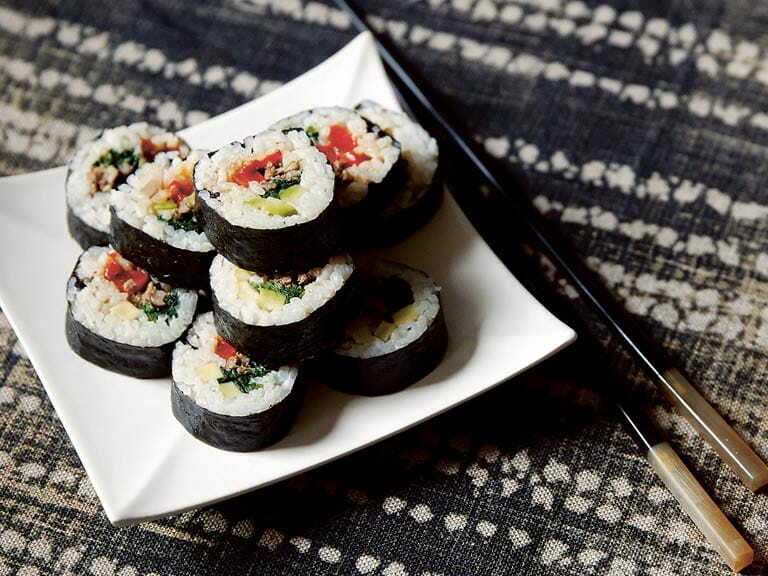 A classic Korean recipe for gimbap, or rolled sushi rice with a minced beef filling. To make the gimbap, place a sheet of gim on a sushi rolling mat, shiny side down. Spread over half the rice, leaving a 5-cm (2-in) border on one side, and pat it down well with the back of a spoon. In alternate lines, vertical to the border, place lines of the avocado, red pepper, spinach and minced beef. Turn the rolling mat so that the 5-cm (2-in) border is furthest away from you. Carefully, roll the seaweed up in the mat to form a cylinder, pressing the rice together through the mat. Finish by rolling the rice log over onto the border to seal. Place the rolls on a chopping board, and cut into 2–3-cm (¾–1-in) slices with a very sharp knife. Eat immediately, or cover and refrigerate.